In the Lower 48, getting from place to place is simple. Hop in a car, and the roads and highways run to virtually any destination with a myriad of helpful and convenient fuel stops along the way. In Alaska, travel is a much different story. Aviation is ingrained in daily life. In most rural locations, air travel is a necessity for emergencies, family visits, work-related travel, social and vacation trips, and transportation of supplies. Tourism is also dependent on aviation, and aviation operations are a staple for the US military and first responders in the state. Understanding the importance of the aviation industry in Alaska, Crowley Fuels broadened its scope of services to include additional aviation fueling stations around the state including six, 24-hour self-service aviation fuels pump stations (card locks) and fueling services at twenty public aviation airports. As the state’s primary wholesale supplier of Avgas, the company resells to all major aviation distributors in the state. The commercial and general aviation sectors count on Crowley’s dependable service as the company supplies jet fuel and Avgas to airports, operators, airlines, and general aviation users in many communities. The turbine aircraft market uses jet fuel and Crowley distributed 13.4 million gallons in 2018 to keep the planes flying at peak performance. For smaller aircraft, such as Cessna planes in general aviation, and larger vintage aircraft, Crowley provides Avgas to fuel the piston engines. 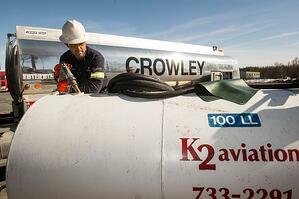 Crowley provides customers with a range of airport delivery options, from fueling into the aircraft directly (into wing), to pumping into a tank in the cargo compartment (into belly), or to a storage tank at the customer’s airport location, allowing customers to choose the level of service that best meets their needs. With a growing Crowley network of six card lock locations, pilots avoid delays and receive fuel along their flight plan. The card lock system operates much like self-serve gasoline stations people use to fuel automobiles and allows aviators to refuel on their own schedule. Additionally, the company provides into-wing services at ten airports around the state and delivers to many on- and off-airport tanks, meeting the need for aviation fuels statewide whether routine, seasonal, or temporary. Tourism is a critical element of Alaska’s economy, and Crowley plays an important part in ensuring that visitors experience the state’s natural beauty. 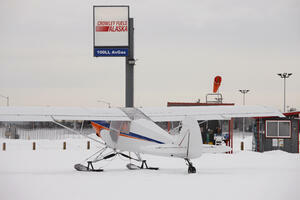 K2 Aviation operates a busy flight hub at the Talkeetna airport. Crowley delivers jet fuel for the company’s turbine Otters and Avgas to fuel its piston aircraft. Suzanne Rust, vice president, general manager, and a co-owner of K2, says Crowley’s service is responsive, timely, and dependable. That’s valuable because her business depends on quickly and safely cycling passengers on and off flights, which can sometimes total fifty or more per day during peak season. Government agencies rely on Crowley-provided fuels to support national defense, public safety, and other operations. This fuel keeps a variety of aircraft, including Chinook helicopters, water bombers (firefighting tanker planes), and fighter jets in the sky. In Anchorage, the Defense Logistics Agency (DLA) relies on Crowley to manage its receipt of Jet fuel into the Port of Alaska under a long-term terminal agreement in support of Joint Base Elmendorf-Richardson. Fuel is delivered via barges where it is then stored in Crowley’s tank farm and pumped to the base. Additionally, Crowley supplies fuels in support of the Alaskan Fire Service, the National Parks Service, and the US Army. 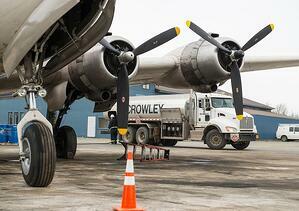 Crowley’s retail aviation business relies on a dependable network of truck drivers to safely transport fuel to terminals and stations in various parts of Alaska. Aviation fuels are transported from local Alaska refineries, or in the case of Avgas, which is not produced in-state, from the West Coast, to Crowley’s local Alaska terminals via long haul trucks or specialized barges. From the terminals, local trucks can then deliver fuels to various aircraft, airports, tanks, and stations. Crowley has long emphasized safety and quality control, and it’s particularly important for aviation fuels. Aviation fuel, which is one of the most carefully controlled petroleum products, must meet demanding quality standards for the safety of anyone who uses aircraft. 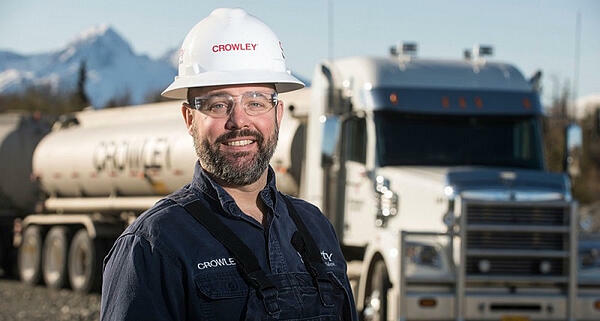 At every point in the process, Crowley maintains strict protocols backed with significant investment in employee training to ensure the fuel is transported, stored, and handled correctly, meeting the highest regulatory and company standards. Quality, round-the-clock service represents Crowley’s approach, now and in the future, to finding innovative, dependable solutions to meet customer needs.